Total Running time | 1:10:24 min. 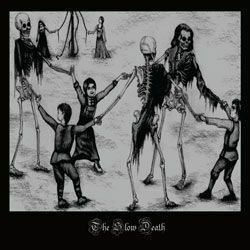 Reissue of the debut self-titled release by The Slow Death with Aurora Australis. Crushingly slow and torturous Death / Doom metal with members from Murkrat and Mournful Congregation. The album ranges from Funeral Doom influenced tracks with gravelly male vocals and brutal slow guitar riffs contrasted by ethereal female vocals, to more contemporary Death / Doom incorporating some melody and reaching near mid-tempo pace.